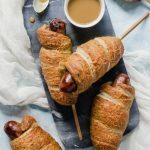 These parmesan pretzel brats pack a flavorful punch, and are the perfect tailgating, carnival visiting, or just comfort food dinner option. Contrary to all appearances on this blog, life at my house is not all pastries and ice cream. We do eat dinner, and take out and convenience foods are a rarity. That means that I’m generally freaking out at about 4:45 every day because, though dessert may be ready to go, dinner is just now on my radar. Don’t act like it doesn’t happen to you too. And if it doesn’t, I’ll pay you to come to my house and make something from scratch. Deal? These parmesan pretzel brats are perfect for all of the things that come with cold weather. Whether you’re into fairs, game days, or just good, warm food, these will tick all of your boxes. Think of them like a corn dog, but soooo much better because Pretzels > Cornbread, and Brats > Hot Dogs. If you don’t agree, well… don’t hurt me. But we both know I’m right. These were originally inspired by this recipe from What’s Gaby Cooking. But she uses hot dogs, and that’s just a non-starter for me. It’s not due to food snobbery, but rather an unfortunate childhood incident featuring hot dogs and food poisoning. It may have been years ago, but I still haven’t moved on— I may be scarred forever. But the whole pretzel with a sausage idea looked so appealing, I figured it couldn’t hurt to try with a sausage that I do enjoy. And they were a fun way to mix it up— a little more work than my standard dinner, but a lot more fun. For the record, I started long before 4:45. I served these with honey mustard sauce, but you could make or use ketchup, or warm up some marinara. Oh! You could even sub Italian Sausages for the brats if you want to do marinara. It would be like going to an Italian carnival! It’s like pizza on a stick. And how could that be a bad idea? Also, you can make these ahead and reheat as needed. It’s like something you would get from the freezer section of your grocery store, minus all of the unpronounceable and questionable ingredients, and plus a whole lot of flavor. Win-win for all parties involved. 1 ½ tsp. table salt. ½ cup grated parmesan + a couple tablespoons extra for topping. To make the pretzel dough, combine the water, sugar, and yeast in the bowl of a stand mixer fitted with the dough hook. Let them sit until the yeast becomes foamy, about 5 minutes. Add the flour, 4 Tbsp. of the melted butter, salt, seasonings, and parmesan. Turn the mixer on low until the flour is all absorbed, then turn it up to medium and knead for 5-6 minutes. The dough should form a ball and pull away from the sides, and is ready when you gently press a finger into and it springs back. After it is done kneading, oil a clean bowl. Shape the dough into a ball (you may need to put a bit of oil on your hands) and place it in the oiled bowl. Cover it with plastic wrap and set it in a warm place to rise until doubled—this should take 1-2 hours, depending on how warm your kitchen is. While the dough is rising, heat a frying pan over medium high heat. When you flick water at it and the droplets dance and sputter, it’s hot enough. Add the sausages and cook them for just a couple of minutes on each side. You want the outsides to be nicely browned without cooking them all the way through—they finish cooking in the oven. Insert a large bamboo skewer into the end of each, until it is about an inch from the end of the sausage. They are now ready to be wrapped and roasted. Once the dough has doubled, preheat the oven to 450° and line two large baking sheets with silicone mats or parchment paper. Place about 10 cups of water into a large pot and bring it to a boil over high heat, then add ½ cup of baking soda. Divide the dough into 10 evenly sized pieces (if you have a scale, they should be about 100 grams each), then roll each of them into a rope about 15-18 inches long. Slightly flatten the rope of dough, then wrap it around one of the sausages, being sure to pinch the ends together to seal. Carefully drop a pretzel brat into the boiling water and cook for 30-45 seconds. Remove with a pair of tongs and place on one of the lined baking sheets. Repeat the process with all of the sausage. Once they’re all boiled, brush them with the remaining 2 Tbsp. of butter and sprinkle with a bit of parmesan cheese. Place the baking sheets in the oven for 20-25 minutes, checking them after 10 minutes to rotate the sheets. Remove them from the oven when they are a deep golden brown all the way around. Allow them to cool slightly, then serve with dipping sauce(s) of your choice. Don’t overboil the pretzels. If you do, water can get trapped inside and leave the bread around the sausages wet and soggy. Blech. These freeze and reheat very well! After thawing in the fridge, place them on a baking sheet and heat in an oven at 350° for 10-15 minute, or until the outsides are crisp. For these sticks, I cut a couple of inches off of chopsticks, but you could also use large kebab skewers if you prefer.